Can you use an AR15 Trigger In a AR-10 or 308 AR? AR15 Trigger In a AR-10 or 308 AR: One of the most common questions we get on the forum or facebook is “CAN I USE AN AR 15 TRIGGER IN A AR-10 or 308 AR?“. Well the answer is not black and white. Most AR15 triggers will in fact physically fit and function in a current AR-10 and 308AR rifle. However the reason AR-10 and 308 AR specific triggers exist is for one main reason, military primers. The primers in military ammo often require more energy to ignite the primer than .223/5.56 ammunition. The way they extra energy is achieved with a heavier hammer and a more powerful hammer spring. 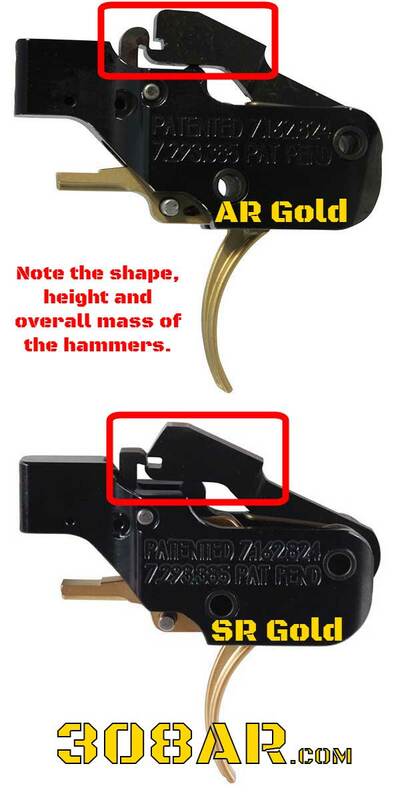 If you look closely at the picture above you can see that Pact in their AR Gold and SR Gold Triggers increases the height of the hammer slightly to gain the extra mass. AR15 Trigger In a AR-10: There are many shooters successfully using AR-15 TRIGGERS in their AR-10 and 308 AR rifles however the risk is reliability. Our suggestion is always utilize a trigger that is specifically stated by the manufacturer to work in a AR-10 and 308AR rifle. There is typically no cost difference unless you want to utilize the least expensive triggers or a AR-15 TRIGGER with a TRIGGER JOB. In either of those cases I would have to ask why bother? Remember a quality trigger is the single best improvement you can make to any AR 10 and 308AR rifle. Skimp elsewhere. $189 – CMC – AR-15 TACTICAL TRIGGER GROUP – CMC triggers are listed as AR-15 TRIGGERS but according to the manufacturer suitable in AR-10 and 308AR rifles. The CMC line of trigger probably represent the best value in performance versus cost. The CMC line of triggers is my recommendation for shooters who can’t afford the $280 triggers. The differences in performance are so close the average shooter might not be able to tell the difference. $279 PACT SR GOLD TRIGGER MODULE – I know the Geissele has developed a massive following. For my finger the PACT ATC SR GOLD has been and still is my favorite 308 AR TRIGGER.